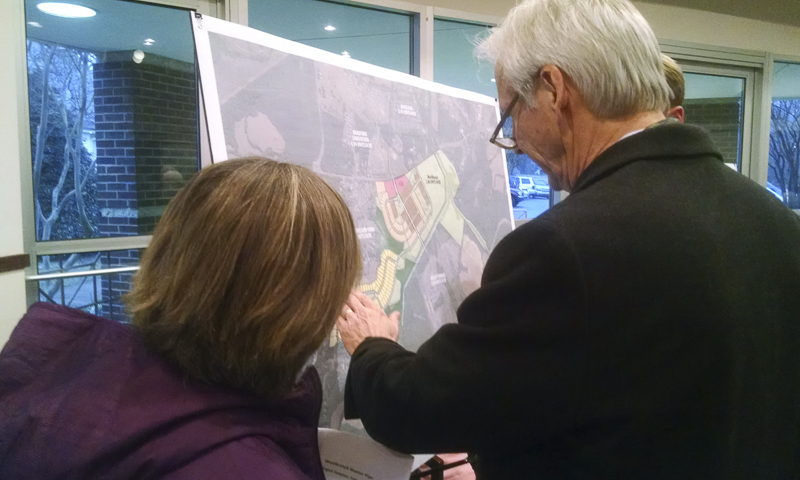 A steady stream of residents and town officials came to Davidson Town Hall Monday evening for a look at the proposed 306-unit WestBranch development off Davidson-Concord Road east of town. 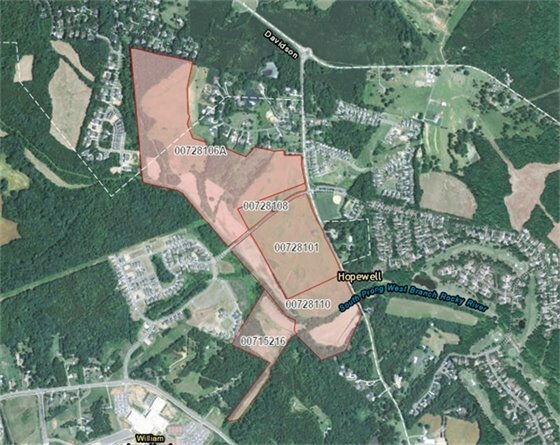 Lennar Carolinas LLC wants to put a mix of townhouses and single-family homes on land owned by the Westmoreland family. Not surprisingly, traffic was the biggest worry on residents’ minds as they studied site plans. Map shows the site of the proposed WestBranch project. Davidson-Concord Road runs top to bottom along the right side of the 170-acre parcel. Some expressed concern that the new development would connect to surrounding neighborhoods, in particular the Hudson Place neighborhood just to the west. 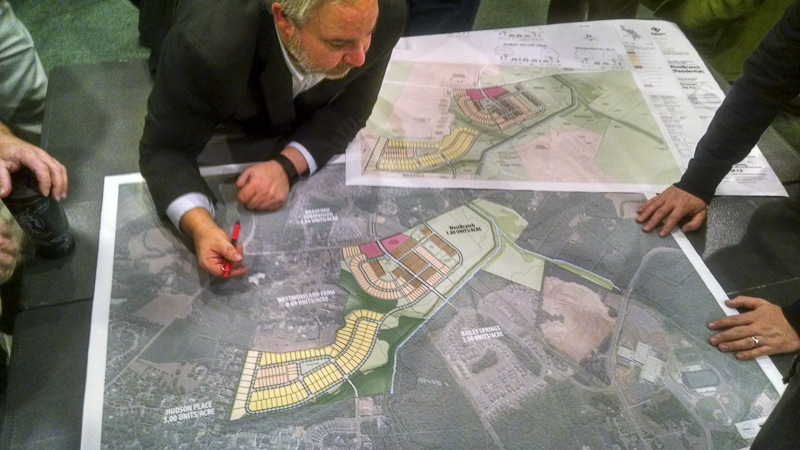 Under a policy of promoting connectivity and providing alternate routes around town, the Town of Davidson requires new developments to link with existing neighborhoods. The property is opposite the Beaver Dam historic site and along the West Branch Greenway, and would be called West Branch. Some residents also were concerned at the loss of open space. But the developers point out that 96 of the 170 acres, or 56.5 percent of the site, would remain open. That includes land directly across from Beaver Dam. Other concerns included how an influx of new residents would affect already crowded schools. A Lennar representative at Monday’s drop-in workshop said his company had outbid several other would-be developers for the right to build the project. Lennar hopes to begin construction by year’s end and it could be built out within four or five years, he said. Monday’s workshop did not discuss another aspect of the project. Zoning for the area calls for a small commercial area, described as “neighborhood services,” at Davidson-Concord Road and Robert Walker Drive. The Westmoreland family will choose a separate developer for that later. Lennar’s development proposal follows a re-zoning of the Westmoreland site in 2015. Before that, the site’s “rural preservation” zoning allowed up to two units per acre, while requiring 40 percent open space. That would have allowed 336 homes. The change – to “neighborhood general” – limited how much of the site could be developed. And it required the small amount of commercial in a “neighborhood services” zone. Meanwhile, WestBranch also has stirred controversy because Davidson Town Commissioner Brian Jenest’s firm ColeJenest & Stone is Lennar’s planner for the project. As Rick Short has reported on his ShortChronicle blog, Jenest had asked to recuse himself from a vote on revising the historic designation for the property, because his firm is working for the developer – an apparent conflict of interest. But three fellow commissioners – Rodney Graham, Stacey Anderson and Jim Fuller – insisted that he vote. As Jenest told me Monday night, he ultimately abstained. The project in its current form does not require any rezoning or consideration by the Town Board. It next goes to the Planning Board for review. More information about the project is on the town website, www.townofdavidson.org/WestBranch. 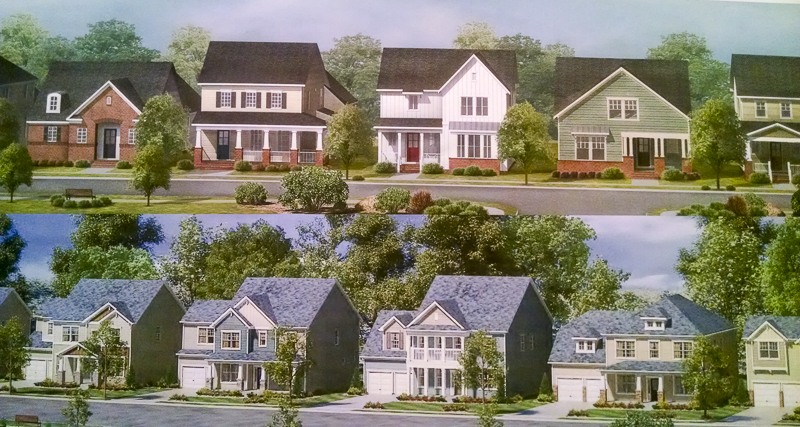 Lennar showed drawings of what the WestBranch single-family homes might look like. Drawings of proposed town houses.